Use Charizard to fly to Heahea City. 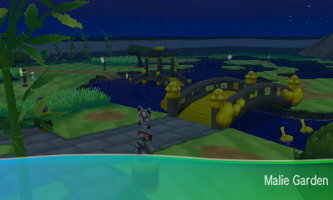 Heal up at the Pokemon Center and then head right until you get to Hano Grand Resort. You can continue to the right to Hano Beach to find a Zygarde Cell near an umbrella. You can also speak to a female swimmer for a Soda Pop. You can also find a Poison Barb and a Pearl String if you surf north of the beach. There's a quest to find 6 Pyukumuku that can land you 20,000 pokédollars upon completion. After gathering what you'd like on Hano Beach, head north and enter the building. A man named Faba will greet you here. Agree to go with him to Aether Paradise. 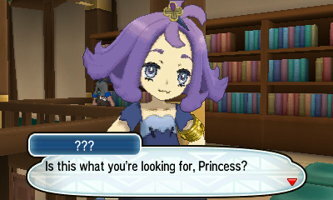 A lengthy cutscene will follow where you'll be introduced to Wicke. Head to the left, north, and then to the right. 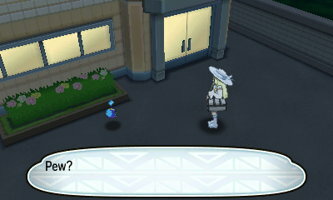 You'll be introduced to the Aether Foundation's president, Lusamine. A strange creature will appear called ???. Approach it to engage in battle; it's a Rock/Poison type and will flee after a few turns if you don't defeat it. Lusamine will identify it as an Ultra Beast. Wicke will then give you TM29 - Psychic and send you off to your next island. As soon as you get to the island, Hau will challenge you to a battle. He's has a Lv. 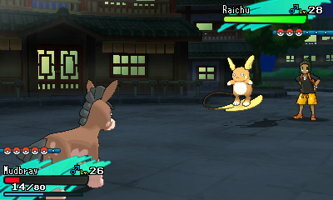 28 Alolan Raichu, a Lv. 28 Eevee evolution (based on your starter), and a Lv. 29 starter evolution. 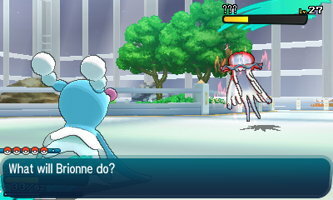 After the batle, heal up at the Pokemon Center and enter Malie Garden to the left. Head to the right perimeter and defeat the trainer and grab a Grassy Seed from an item ball further up the path. Head back to the left side of the garden where you can pick up a Luxury Ball and defeat the small trainer walking in a circle. Continue north and cross over to the center island where you'll find a Rage Candy Bar underneath an umbrella. Keep north and to the left to face another trainer and find a Zygarde Cell. Head straight north for a Big Mushroom. 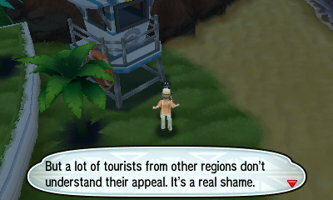 Then go talk to the professor who is sitting on a bench in the center of the island. After some dialogue with the professor, exit the garden to the south. 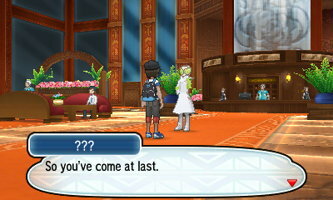 Lillie will be waiting for you here, she'll ask for your help again. Make sure to grab the Zygarde Cell (daytime) from beneath the truck here. Head left a bit more and you'll quickly run into a very familar face... 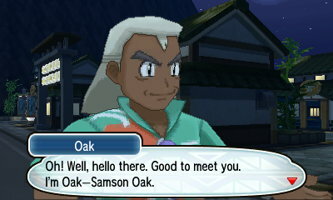 Professor Oak. Head north towards the library and you'll run into Lillie again. Head to the second floor of the library when the first cutscene ends. Exit the building after another cutscene and head south and to the left out of the city. 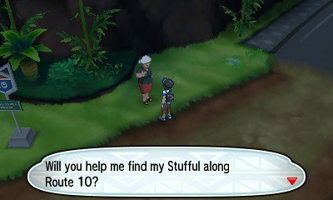 If you speak to the lady upon entering Route 10, you can agree to an optional sidequest to find her 8 Stufful on the route. You can find a Paralze Heal in an item ball next to the first trainer and your first Stufful across from him. There is a Stufful behind this first tree. There is also a pile of berries next to a lady who will heal your Pokemon and another Stufful is hiding behind the palm tree. The next Stufful is hiding north of the second trainer on the route. Another Snufful is behind the sign just north of this and is also next to a Zygarde Cell. Head left into tall grass to find another Stufful and an X Accuracy. You'll find another Stufful in the open on the left side of the route and there is another hidden in the tall grass to the right of it next to a third trainer. Head back down the trail and talk to the old woman again and she'll give you a Never-Melt Ice and 15,000 pokédollars for your troubles. Now, head north back up the route until you get to the bus stop. 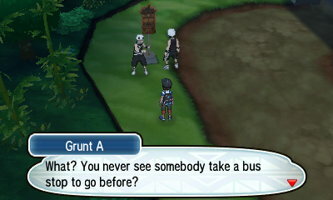 Confront the Team Skull Grunts guarding the bus stop to battle them. After you've beaten them both, Professor Kukui will come and speak with you. Select "yes" at the bus stop and get on the bus! Heal up at the Pokemon Center if you need and then head towards the building. You'll need to beat a trainer named Molayne to pass. He has a Lv. 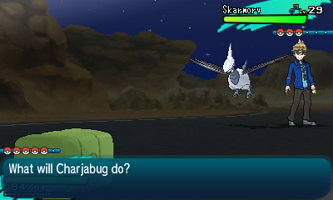 29 Skarmory, a Lv. 29 Metang, and a Lv. 30 Alolan Dugtrio. After you've defeated him, enter the building and go through the door here. If you head left you'll find a Zygarde Cell. Head straight through the next door and you'll enter a room with Captain Sophocles. 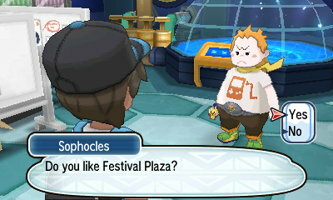 Say "yes" when asked if you like the Festival Plaza (he runs it, don't hurt his feelings now). His trial will start after the lights go out. Sophocles will ask you a series of questions about familiar Pokémon sounds. A Pokémon will attack after each answer. Here are the answers (in order) followed by the Pokémon you'll need to defeat: Pokémon Center (Grubbin), Rotem Dex (Charjabug), Charjabug (Charjabug), A Totem Pokemon (Totem Vikavolt). After you answer the fourth question, a Lv. 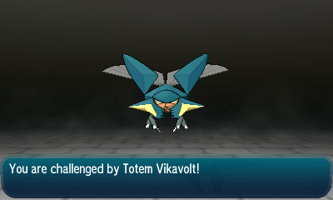 29 Totem Vikavolt will appear. It will call Lv. 27 Charjabug as it's ally Pokemon. A strong Rock or Fire type Pokemon will make your life easiest. 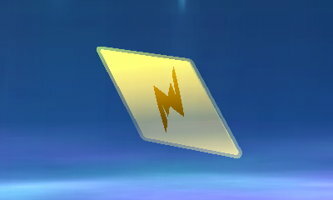 Once you defeat the Totem Pokémon, you'll get Electrium Z. You'll also get the Steelium Z from Molayne along with the Professor's Mask. This marks the end of the Mount Hokulani trial.